The Visual Features Stage allows you to add animated water and fire effects to your design. On this stage, you can add water features such as spillovers, waterfalls, and deck jets to swimming pools and spas, as well as add running water to fountains and rock waterfalls. You can also add burning fire to barbeques and fire pits. 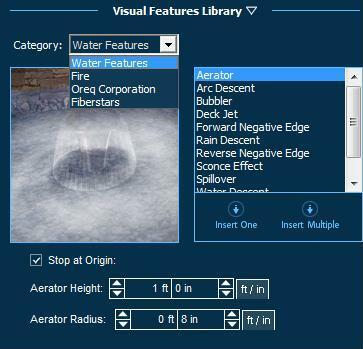 The Visual Features library contains generic water features, brand name water and fire features from vendors. and different color variations of fire. First select the type of Visual Feature you would like to insert from the Category drop down box. Then left click on the name of the feature in the list. A preview image of the feature will be displayed to the left of the list. Click on the Insert One or Insert Multiple button to insert the selected feature. Most of the water features such as Arc, Rain, and Water Descents, Spillovers, and Vanishing Edges will automatically snap to the edge of the pool or spa as you insert them. Each of the features will also conform to the shape of the pool or spa, bending around corners and curving around arcs. As you increase the length of these water features they will continue to conform to the shape of the pool or spa. Some water features may also be placed on other objects, such as house and deck pieces, but they will not conform to the shape of those objects and will remain straight. Other features such as Fire Effects, Deck Jets, and Bubblers are placed on surfaces and so do not conform to the shape of the pool or spa. NOTE: To have water features spill into a trough or basin area, create the trough in the Spa Stage. Visual Features Options: Each visual feature has its own unique options. When you select a feature from the list, you will see the specific options available for that feature below the preview image. You may change the settings for any feature you have already inserted by selecting the feature in your design and changing the options in the menu. Angle: This control sets the selected water feature to a specific angle. Descent Length: This control allows you to set the length of a descent water feature, adjusting how wide or narrow it is. Edge Angle: This control allows you to set the slope of the dam wall for a spillover or edge water feature. Edge Length: This control allows you to set the length of an edge water feature, adjusting how wide or narrow it is. Height: This control sets the selected water feature to reach a specific height. Pressure: This slider adjusts the force at which water flows from a descent feature. Increasing the pressure will increase the distance the water flows out from the feature, while lowering the pressure will decrease the distance the water flows out from the feature, eventually reversing it. Reverse Direction: This check box causes the water flow to reverse direction. This is helpful if a water feature is facing the wrong direction. Stop at Origin: This check box controls the flow of water in some water features. When the box is checked the water flow will fall and stop at the same height as where it starts, allowing for open space underneath. Unchecked, the water will fall until it hits the ground. Water Pressure: This control allows you to adjust the percentage at which the water flows over a spillover or edge feature.